For those of you lucky enough to live in South Texas or in a similarly temperate climate, you are able to enjoy shopping at farmers markets all year long. Beets, broccoli, Brussels sprouts, cabbage, carrots and cauliflower. These are the primary local produce picks you are presented with every winter as grown by our dedicated farmers. Call me a mono-eater, but, when certain foods are in season, my diet has a tendency to be mostly comprised of that item or items. Lately, cauliflower and I are BFF’s (best friends forever–pardon my 1980’s reference here) and, despite David begging me not to, I came home last week with a gigantic 8 lb. head of cauliflower. And a 5 lb. cauliflower. Needless to say, I had little room in the fridge for this amount of cauliflower and David had little tolerance for or interest in eating any more cauliflower. I turned much of the 13 pounds of cauliflower into cauliflower rice and roasted some as well and I literally lived on this for days. Even though I had had enough, there was still plenty of cauliflower remaining. But there had to be something different I could do to the cauliflower which would make me (and David) think it was something other than what it was since neither of us really wanted to eat any more cauliflower. Fortunately, I had chosen cauliflower as the “pick of the week” in the Quarry Farmers & Ranchers Market weekly enewsletter the previous week for which I found several unique ways to use this cruciferous winter vegetable. 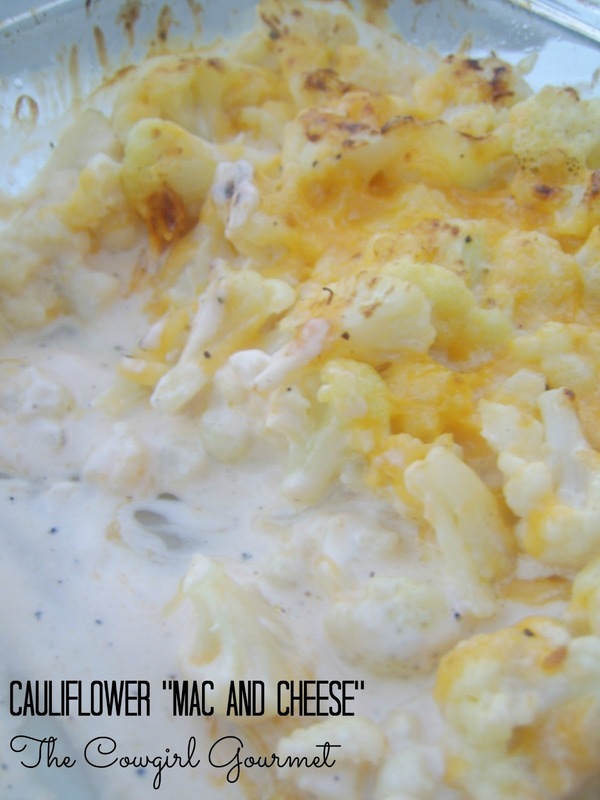 Having never ever been a “casserole” person, admittedly it was the “mac and cheese” concept that won me over. Considering I had been living on cauliflower rice, I thought this decadent approach was deserving a chance in my food repertoire. I could certainly handle trading in the pasta for cauliflower and adding a cheese sauce since fat is clearly a better choice than carbs. Couple that reality with the fact that this recipe is gluten-free and grain-free and I was done. If you love mac and cheese, this dish will be devoured. Using cauliflower as the pasta, I am betting that you'll never realize what's missing. It's really good. Preheat oven to 375 degrees F. Bring a large pot of water to a boil. Once it starts to boil, season it with kosher salt. Spray an 8 x 8 baking dish with vegetable oil spray. While the cauliflower is cooking, bring the cream to a simmer in a small saucepan. Once it's simmering, whisk in the cream cheese chunks and mustard until smooth. Stir in 1 cup of cheese and add the salt, pepper and garlic powder and continue whisking until the cheese melts, about 1 to 2 minutes. When the cauliflower is ready, drain the cauliflower in a large colander and let sit for a few minutes so all of the water drains. If needed, pat between several layers of paper towels to dry the cauliflower thoroughly. Transfer the cauliflower to the baking dish. Pour the cheese sauce over the cauliflower and stir well to combine. Top with remaining 1/2 cup of grated cheese. Bake until browned and bubbly hot, about 15 minutes. If you want the cheese to be nice and crisp, turn on the broiler and watch carefully so it doesn't burn. When it's as golden as you like it, remove from the oven and serve.